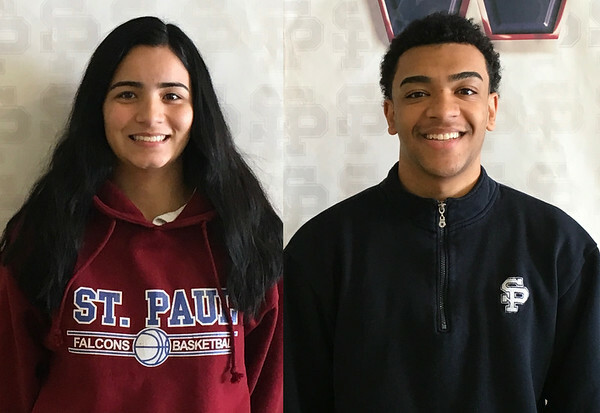 St. Paul basketball is represented with this week’s Athlete of the Week picks, as Falcon juniors Janessa Gonzalez and Noah Waters receive the honor. This is the second such basketball recognition for Gonzalez, with Waters earning his initial nod as a first-year starter this season. Gonzalez, the daughter of Tommy and Zenaida Gonzalez of Meriden, had a game-high 21 points in a 63-33 win over Wolcott on Friday and contributed 15 points against Torrington three days earlier. A 2017-2018 All-State player who is among the NVL’s leading scorers this season, Gonzalez has an average of 17.6 points per outing. St. Paul coach Joe Mone said her ACL surgery from a year ago seems to behind her now. Like it is every year, Falcons’ goal is to go as far as it can in the state tournament. Another goal is to defend their NVL division title from last year. Her individual goal is to play to the best of her ability. In addition to basketball, Gonzalez was a standout in softball for St. Paul her freshman year. The basketball injury last season kept her from the spring sport her sophomore year and she is looking forward to returning to the ball field. Her standout freshman season included some solid statistics: .466 batting average, 24 runs, 21 RBI, three doubles, two triples, and one home run. In her freshman year, the Falcons, 22-6, reached the Class S finals, the best state finish ever for the school. Last year’s squad reached the quarterfinals. Although she has some time to decide, Gonzalez, who has also won all-conference and All-Press recognition, is leaning towards playing basketball in college. As far as studies, she’s unsure of what they will entail for now. Playing softball, too, can’t be ruled out. Waters, who concentrates on basketball year-round, is the son of Heidi and Marcus Swain of Bristol. He was a standout in two away losses for the Falcons last week, 55-53 to Wolcott on Friday and 75-62 to Torrington on Tuesday. He was the leading scorer in both, recording 21 and 26 points, respectively. He’s averaging 18 points the past six games and 11.0 overall on the season. His field goal shooting accuracy is 40.3 percent and he is 15-for-15 from the free throw line. “Noah and I have a great relationship,” St. Paul coach Steve Phelps said. “His willingness to be coached is one of his strongest assets. Noah’s daily recognition of the area of his game that he needs to improve upon is contributing to his development as a player. The Falcons had a record of 7-9 coming into this week after going 13-10 last year as NVL division champions, who reached the second round of state Division III play. “I think we’re very confident,” Waters said. “We’re starting to progress and we’re learning from our coaches every day to get better. Our goal, obviously, is to make the postseason, but we’re trying to make a bigger statement. And what is it he likes about the sport, one he only took up about five years ago? Waters has already decided he wants to play basketball at the next level. He’s also thinking of his studies, which may include a career in business, but that could change between now and then. Posted in The Bristol Press, Athletes of the Week, St. Paul on Monday, 4 February 2019 21:44. Updated: Monday, 4 February 2019 21:46.